The most recent optical outburst of SS Cygni has come to an end. AAVSO observers are encouraged to continue their intensive coverage of SS Cyg through the end of this week, but for those of you who observe this star regularly, please continue to do so! SS Cyg is one of the best-observed variable stars in the world, and it is always a good target for variable star observers. The JACPOT collaboration  continues to receive new data from X-ray, optical, infrared, and radio telescopes from around the world. AAVSO observers and their data are a major part of the effort, and your work is greatly appreciated. Thanks, and well done to everyone who has participated so far! The AAVSO and its observers are working with Dr. James Miller-Jones of (NRAO) and an international collaboration to study jet formation in outbursting compact binaries. The AAVSO was asked in mid-April to monitor the dwarf nova SS Cygni for signs of outburst, and amateurs detected first signs of an outburst on April 19. Miller-Jones and collaborators turned a number of telescopes around the world toward SS Cyg to follow this event, and results of these multiwavelength observations -- from radio wavelengths to X-rays -- are beginning to come in. Miller-Jones is a member of an international collaboration to study the phenomenon of jet formation in X-ray binaries -- binary stars composed of a normal star and a compact object like a white dwarf, neutron star, or black hole. Transfer of matter from the normal star to the compact object can release energy, often in the form of X-rays, but sometimes also as jets of relativistic particles. A major question of the group is how these jets form in the different classes of binary, especially in white-dwarf binaries which are not as energetic as the other kinds. SS Cygni is the brightest of the dwarf novae in our skies, and jet activity has been detected in the past (see Koerding et al, 2008, Science 320, 1318 ). Miller-Jones and collaborators are revisiting SS Cyg with the newly refurbished Very Large Array (now called the Expanded Very Large Array  or "EVLA"), and with the Very Long Baseline Array  (VLBA). When AAVSO observers first noticed a brightening in SS Cyg on April 19, we began working closely with the researchers to prepare for an outburst. When it became clear that SS Cyg was indeed an outburst, a number of ground- and space-based observatories turned toward SS Cyg, including the EVLA and VLBA, the Swift X-ray satellite , Faulkes North , the FanCam IR instrument  at the University of Virginia, PAIRITEL , and other observers around the world. The first science results of this campaign are now coming in. 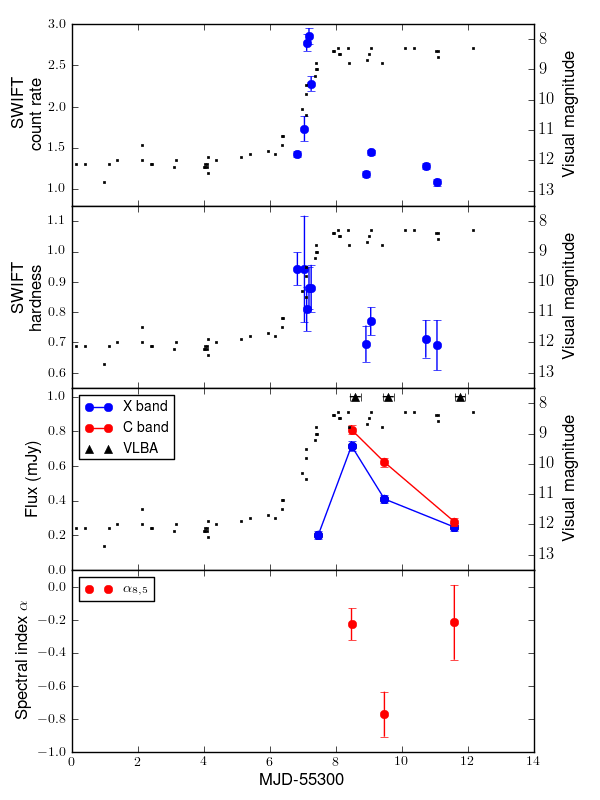 The image to the right shows the AAVSO optical, Swift X-ray, and EVLA radio observations. The X-ray behavior matches what was expected, and was first described by another AAVSO collaboration with Peter Wheatley and Chris Mauche (see Wheatley, Mauche, and Mattei, 2003, MNRAS 345, 49 ). Radio observations are looking encouraging with, high signal-to-noise detections at both 5 and 8 GHz with EVLA. The radio observations -- particularly the relative strengths of the two different frequencies -- will be key to understanding the origin of the radio emission during outburst. AAVSO observers are encouraged to keep following SS Cyg through the end of its current outburst. All observations, including visual estimates, multicolor CCD photometry, and CCD ttime-series observations are all needed. Your observations will contribute to the success of this campaign, so please help as best you can! Keep following this page to stay informed about the progress of this campaign, or visit the website of the JACPOT collaboration !